Stayed a month during Spring Break season in Galveston TX. RV management know they’ve got a high demand commodity so unapologetically offer no discounts or weekly/monthly rates. Park is located right on Stewart Beach on the east end of the seawall and within easy walking/biking distance to many eateries and attractions. Right on the seawall which is a 10 mile boardwalk/bike path running the length of the city. Roads and sites are paved and level. Grass in between and OK spacing…close, but not cramped. Utilities for the back-in sites are in the rear, so extra hose/sewer might be needed. No tree obstruction so Sat signal good and they have cable with HBO! Wifi is present and ok, but drops off frequently. Very nice infinity pool with adjacent hot tub and excellent office/facility building with showers, laundry and rec room. That’s the good…now the not so much: Noise. Traffic noise is constant. Also there is a tourist helicopter about 100 yards away that features 5 minute rides, taking off and landing over the park multiple times an hour. This park has many, many rules: 2 vehicles per site, no kids under 13 in spa, pick up after dog, etc…none of which are enforced. We saw children as young as 3 in the hot tub every day we were there, many of them related to or guests of park employees. Dogs crapped in the middle of the roads. The employees are surly and rude. Management is hostile and aggressive. When I asked about changing sites, I was told the sites are assigned at check-in by the computer system and they have no flexibility or ability (or care to) make changes based upon requests or preferences, despite numerous empty sites and most of the RV’ers here being short-termer/overnighters. If you persist, they will threaten to kick you out with a strict no refund policy. Basically, they could care less about customer service. The manager even refused to provide his name. They have you over a barrel and know it. If we hadn’t been on the hook for a month, we would have left for one of the many other friendly RV parks. Galveston and the area is full of fun and interesting tings to do. Very bikeable town and you can enjoy the Victorian neighborhoods and historic architecture. Opera house and community theater live music at many venues. Tons of very good restaurants. Excellent upscale seafood at Gaidos. Very good Mexican at Tortugas, Taquilos and Brewchachos. Johnson Space Center is 30 minutes away and you can easily spend an entire day. Site #1A is awful. It is narrow, jammed up against the office building and beside the overflowing garbage bins. There was insufficient space to extend our awning. Noise from the office / hotel air conditioner kept us awake half the night. This "site" should not be rented out at all. Staff were unfriendly and unhelpful. Nice location if you book a better site. We had stayed here in the past but had to send them photos of our 45 foot Prevost, after passing their entry test we were given a reservation, we had a very nice time here. In June of 18, I called and made a reservation for an area in the park for 2 weeks during the Christmas holidays. Upon arriving I was told that they don't hold any campsites and it's first come first served. I was given an open site that was nice but the attitude of the desk employee was very bad. We were really looking foreword to our vacation in Galveston and her poor demeanor was uncalled for. She said that she would not take my credit card and for us to go find another RV park. I reiterated that we had a reservation and finding another park was out of the question after driving 600 miles. The past manager was very nice and accommodating and helpful while this new person was testy and rude, I am Shocked and Amazed that the owner allows this kind of behavior. She would not give me the Good Sam discount when I mentioned that I belong to the club. This park has changed their camper requirements by allowing Pop-ups and race car trailers, I guess that they must need the money, One day I saw a street persons pushing their shopping cart with their belongs going through the park which made me secure all of our outdoor valuables. When and if we ever return I will find a more secure and friendly location. During our stay this time we met many very nice people sharing the camping lifestyle. this place had clean camping areas and level concrete pads to park on ,I thought it was odd pulling in and having to go up a flight of stairs to get to the office, we were there 1 night passing through an wished I had booked a couple of days just to spend more time in the area, didn't use the pool or anything else except the washrooms .it is in the center of town. if in the area I would stay there again. 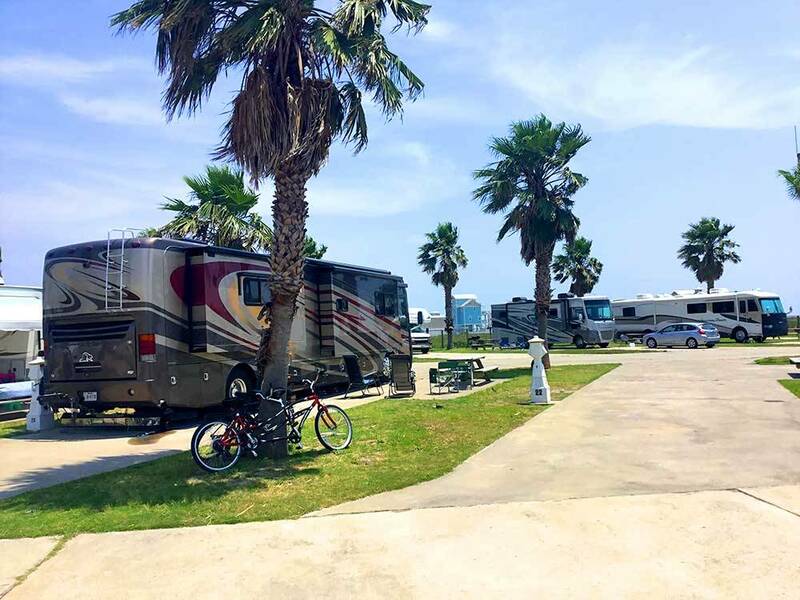 Pro: The campsite is in great location for beach, seawall, and downtown district. For bringing someone who doesn't like camping or don't have enough bed in camper, they have "hotel room" for camper there. I was able to take advantage of that for my parent. Con: During my parent stay in the room, complain of gas smell, the next day thou it was gone. I was able to smell it outside and around the pool area when my parent mentioned about it. Hot tub was just warm to me. I couldn't find the temperature to read or any way to adjusted the setting.. It was evening and the office was close. Make sure when using backup site, that your hookup will reach the utilities.. This was my first site that had hookup in back end instead of middle as most sites I have been. My hookup barely made it after I already setup everything only to find out I just tugged it a bit. I didn't use my tailgate down on the toyhauler, but if I did I wouldn't be able to reach the hookup then. It's too windy to open up the tailgate anyhow. All in .. We would still go again.. We already been there twice..
Clean maintained RV park. One dislike was the pool was not heated having grandchildren with us. Shower room was nice and clean but water pressure not so good. We had a back in spot great location next to the ocean. Would come back , next time a warmer time! We have been staying at SPRVP since it opened 4 years ago, and, until this year, have always been happy with our stay. It is convenient, close to the beach and great for walking on the Seawall. This year it was not for many reasons: 1) Inconsiderate staff - don't care attitude and poor excuses for every problem (see what follows). 2) We made our reservations for December in September and requested a site on the northeast side of the park. When we arrived we were placed in a site with a view of the building, a concrete wall & the highway. We requested a change but were told "We can't. You're here for a month. We never guarantee sites." We never requested a specific site, just a specific area and several of those sites were empty for the short time we were there. 3) The first night our CO2 detector went off. Thinking it was our problem, and after checking everything, we waited another day. The smell of gas only got stronger. We complained to the office and requested a site change. We were told to "deal with it or leave." Since this represented a health problem, we opted to leave and requested our money back, We had only been there 3 days! NOTE:This is a problem that could have been solved when the first person complained (we were not the first). Our daughter called the fire department, who came to check it out. They called the gas company and the problem was corrected within 2 hours. Why did the staff not call the gas company? They did not want to! Why did they not move us - same reason. We will not be back! I have stayed at many many RV parks and this has to be the best one I have seen. 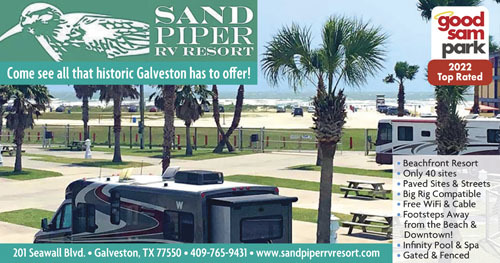 Level concrete pads, a beautiful pool and hot tub, bathrooms and showers were great, friendly and helpful staff, as close to the beach as you can get and right on the edge of all the action of the Galveston Seawall but far enough away not to be a nuisance. Have stayed there twice and plan to go back.